We're in the throws of the monsoon season now. Last two seasons we saw gracious rainfalls Spring and Early Summer. This season, not so. Rains (some heavy) started around July 4th and have continued to present. I'll guess things will quiet down mid August. As the rains fall, flash flooding occurs up in the mountains as basins funnel their water into small runoffs. This washes out roads and traps those on the high side of streams and creeks. The photo above shows tons of rocks washed down from the mountain. This covered about 1/2 the road. 1 of about 7 washouts between Weehawken Trailhead and Camp Bird Mine. 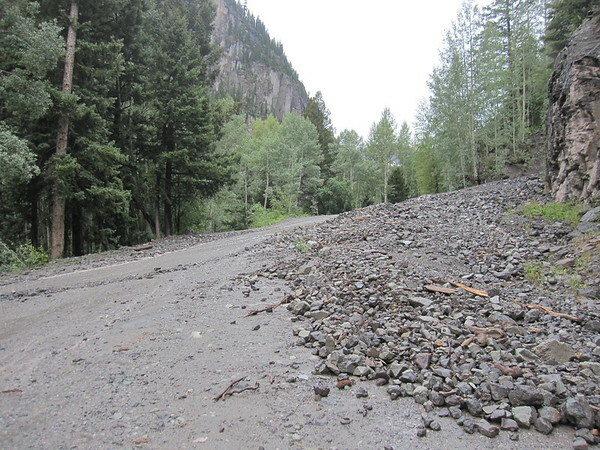 The road that splits off Camp Bird Rd to Yankee Boy Basin is in bad shape too. Engineer Mountain Rd was cleared of its rock fall. That was completed about 10 days ago. 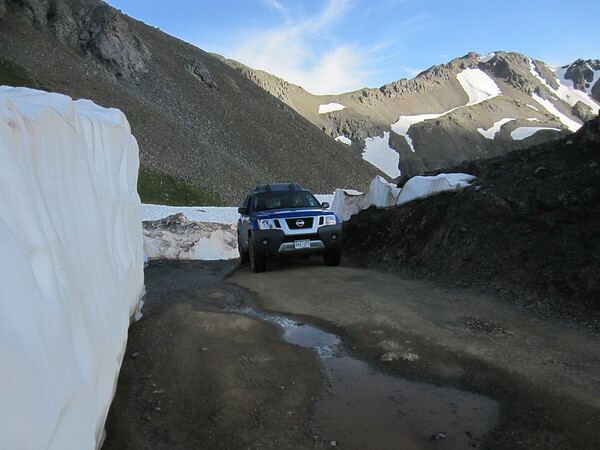 Last time up there (about 1 week ago) the road was washed out thin in one spot. Flash flood warnings continue today and Saturday with relief coming on Sunday. It's been a fun time. Near the Sunnyside Saddle. Lots of snow up in the mountains still. Ridge line to Bonita Peak. 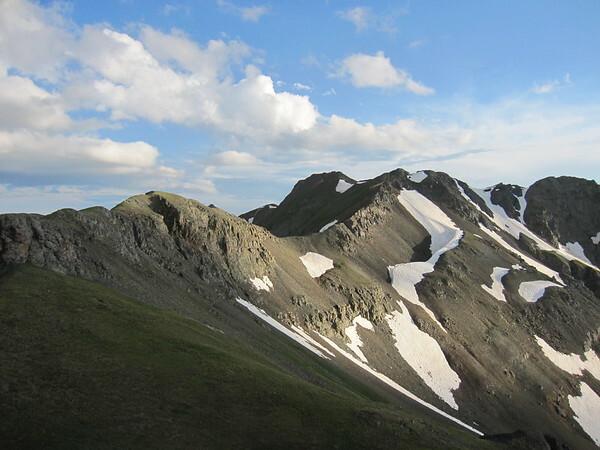 We transversed this ridge line (left to right) to summit Bonita Peak. One peak in on the far right just left of the small cornice. There are many less climbed peaks in those mountains. No one there either which we like. Some are quite technical. This one was of average difficulty with a few sketchy moments. Up/back in 2 hours, average elevation 13k and 1000' of vertical. Ouray County Road & Bridge has been up on Camp Bird Rd and the Yankee Boy stem doing a fantastic job of fixing all the issues. They've got 4 pieces of heavy equipment up there now. Roads ride nicely now. Still seeing rain, however, so more washouts are expected. Hard to predict the scope and severity of potential road damage. Rest assured the county is on it. Next week I'm doing a recon all the way up Yankee Boy to see how that road looks.